Whatever decisions are being made either in Washington, D.C., or on the Donald Trump presidential campaign trail, there is no question that the idea of a border wall between the United States and Mexico is not a popular one among residents living on the U.S.-Mexico border. 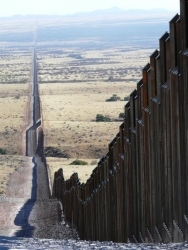 A recent survey conducted by the Conkrite News/Univision News/Dallas Morning News shows that 72 percent of all Americans living along the border and 86 percent of all Mexicans living along the border do not want a border wall. For almost 170 years, Americans and Mexicans on both sides of the border have gone back and forth as trade, commerce and inter-personal relationships have always been the norm. While there are those along the border who may want more law enforcement in regards to undocumented crisscrossing their property, they most certainly do not want an actual wall cutting through their properties. Most Americans living along the border are already unhappy about the fence that was put up. For many American residents, their lands have not only been separated but the area is now heavily patrolled by the U.S. Border patrol. But it goes deeper than that. For such a solid border to be built, the United States would have to renegotiate the North American Free Trade Agreement with Mexico because the border wall will bring some very fundamental changes on what can and cannot cross the border. Commerce will be greatly restricted, and all that was worked out two decades ago will no longer be valid. The people in the border area will be the most affected, and for them trade with Mexico is an important lifeline. Texas Governor Rick Perry understands the dynamics of this relationship with Mexico, and he has signaled his opposition to any border wall if by some circumstances Donald Trump should become president. When Donald Trump proposed his idea of the border wall, he should have consulted with the people living along the U.S.-Mexico border (many of whom are registered Republican voters). This will mean a lot of lost votes for the Republican candidate.